In the past… home to the tragically destroyed Great Exhibition, a solitary thirteen-year-old boy meets his next-door neighbor, a recently widowed young teacher hoping to make a new start in the tight-knit South London community. Drawn together by loneliness, the unlikely pair forms a deep connection that ends in a shattering act of betrayal. In the present… On a cold January morning in London, Detective Inspector Gemma James is back on the job while her husband, Detective Superintendent Duncan Kincaid, is at home caring for their three-year-old foster daughter. Assigned to lead a Murder Investigation Team in South London, she’s assisted by her trusted colleague, newly promoted Detective Sergeant Melody Talbot. Their first case: a crime scene at a seedy hotel in Crystal Palace. The victim: a well-respected barrister, found naked, trussed, and apparently strangled. Is it an unsavory accident or murder? In either case, he was not alone, and Gemma’s team must find his companion—a search that takes them into unexpected corners and forces them to contemplate unsettling truths about the weaknesses and passions that lead to murder. Ultimately, they will question everything they think they know about their world and those they trust most. There are actually three different mysteries presented in The Sound of Broken Glass, but they all blend together seamlessly. The main one, of course, is the case of a respected barrister who is found naked, bound and apparently strangled in a basement hotel room. Was it murder or an accident? Detective Inspector Gemma James and her team must follow some seemingly unrelated leads to discover what really happened that night. Our second mystery revolves around thirteen year old Andy (I adore him!) 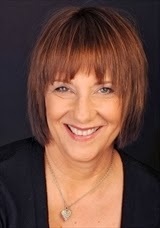 and his next door neighbor Nadine. Fifteen years ago, they forged an unbreakable bond that only the loneliest of souls can understand, but haven’t seen each other since. Why not? What happened to separate them and how does their history relate to the barrister’s mysterious death? Or is it just a coincidence? Third, and it’s more fascination than mystery, is the story of Crystal Palace. Crystal Palace is a neighborhood area of London where much of the action takes place, but it is also the name used to describe The Great Exhibition – an iron and glass building designed by Joseph Paxton which was moved to Crystal Palace Park in 1854 and destroyed by fire on 30th November 1936, according to www.crystalpalace.co.uk as quoted in Chapter One. This history is told to us as research quotes at the beginning of each chapter, from the construction of the building, through its heyday, to its eventual destruction by fire in 1936 and the ruins that are left behind. The Crystal Palace’s story progression seems to perfectly mirror that of our murder investigation as well as the evolution of some of the characters. It’s an excellent feature! It is impossible to read The Sound of Broken Glass and not fall completely in love with the ensemble cast of characters. They each bring a vital perspective to the story that helps form the complete picture in your imagination. It is easy to see them interact with each other, feel their emotions and worry on their behalf. I can’t imagine that it is easy for an author to build such developed characters, other than the usual main two or three, but Deborah Crombie does it well. 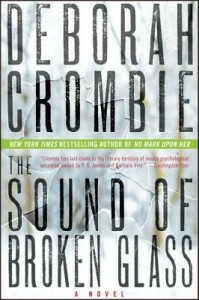 The Sound of Broken Glass is #15 in the Duncan Kincaid & Gemma James Mystery Series, and I’m certain these characters have been introduced and fleshed out over the course of the series, but as a newcomer to Crombie’s work, I felt like I’ve always known them. Even Nadine and Andy, who are unique to this mystery, felt like they’ve always been an integral part of Duncan & Gemma’s story development. Even though The Sound of Broken Glass is #15 in a series, it can hold its own as a stand alone murder mystery. But I defy you to read just the one book without going back to the beginning of the series for the complete adventure. It’s that good. You can click here to read an excerpt and browse inside The Sound of Broken Glass. A friend of mine told me good things about Deborah Crombie earlier this week and now seeing your review, I think I’m going to have to put her on my to-be-read list. Thank you!